The TS4 skintone system has a lot of potential, and I've been working on a tool to make it easier to work with, similar to Skininator for TS3. TONE : A game file which defines a skintone. It links to the color images, the overlays, and contains various settings. Skintone : The skin you click on in CAS, which is defined by a TONE file. Body skin details : A texture with shading, contouring, and details such as muscles and belly buttons. (Yes, I know there's a separate 'skin details' in CAS. Couldn't think of a better term.) There are separate textures for each age/gender/bodytype. Skin color image : A texture which applies color and some shading composited with the skin details. There is one skin color texture which is applied to all age/genders. Overlay : A texture which is layered on top of the skin details and skin color. The ages and genders it applies to can be specified. Cloning Tool : Clones game skintones and creates a package with the TONE files. Clone Package Editor : Open and modify cloned packages. 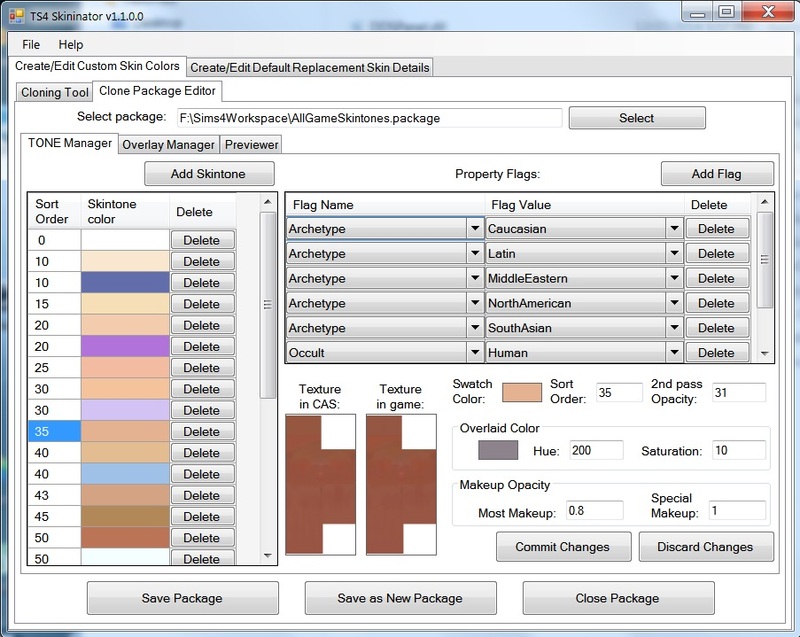 TONE Manager : Add/Delete TONEs, modify flags defining the type and usage, modify the swatch color and various other settings, import and export the skin color images. Overlay Manager : Add/Delete overlays, define which ages/genders each overlay applies to, import and export overlay images. Manage Flags for All : Add or remove property flags/tags for all skintones in a package. 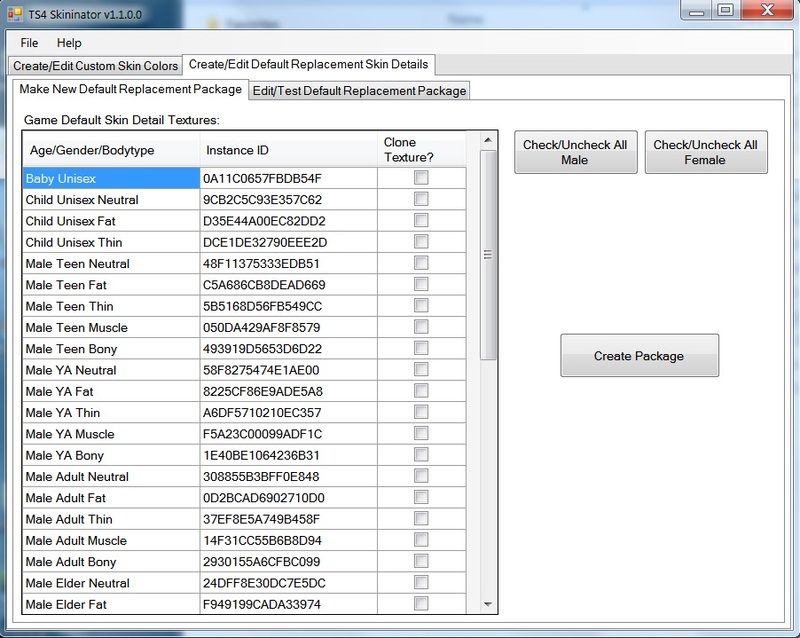 Make New Default Replacement Package : Select which skin details you want to replace and clone them to a new package. 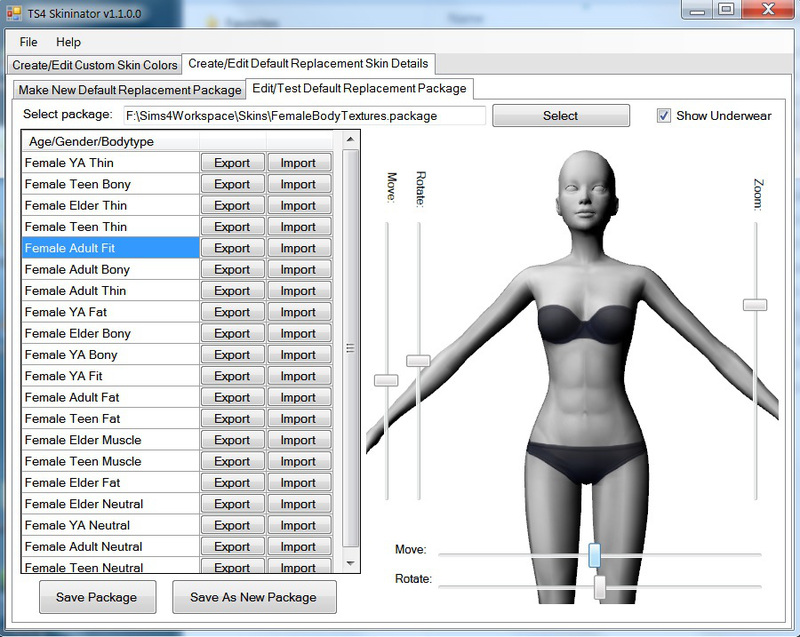 Edit/Test Default Replacement Package : Import/Export textures and preview the skin details. While the preview is reasonably accurate for game skintones, if you modify the overlaid color - especially if you increase the saturation level beyond 40 or so - you probably will not get the same color in-game. If you go over around 100-150 for the overlaid color saturation, you're likely to get weird effects in the game that don't show up in the previewer. EA uses some compositing method I don't understand and can't completely duplicate despite a lot of effort. CAS and the game are the only true test. If it seems like there's a million body skin details textures, that's because THERE ARE. There's a separate texture for every age and every body type. For many purposes you're better off using an overlay. As far as I know there can be only one set of body skin detail textures, no non-defaults. Speaking of overlays, only one will be used for each age/gender. There are two skin color textures; one (a DDS image) is used in CAS and the other (an RLE2 image) in the game. For the CAS image you can import either an uncompressed DDS or a DXT5 DDS. For the game image you must import a DXT5 DDS. You can use the same DDS if you wish. However, you can add a logo or identifier to the CAS image which will show up on the sim in CAS but not in the game. That might be useful since there's no way to customize the swatch except for its color. Note that I haven't tested this with the game set to use hi-resolution on sims. Randomization: Skins are chosen randomly based on the archetypes defined in their flags. The more archetypes a skin has, the more often it gets chosen. If it has no archetypes it will get chosen randomly only if there are no other skins that do have archetypes. The game skins for humans all have archetypes; the game skins for aliens don't have any. Edit: The latest version of the skin TONE resource includes tuning, which appears to determine for which sims a skin gets randomized. 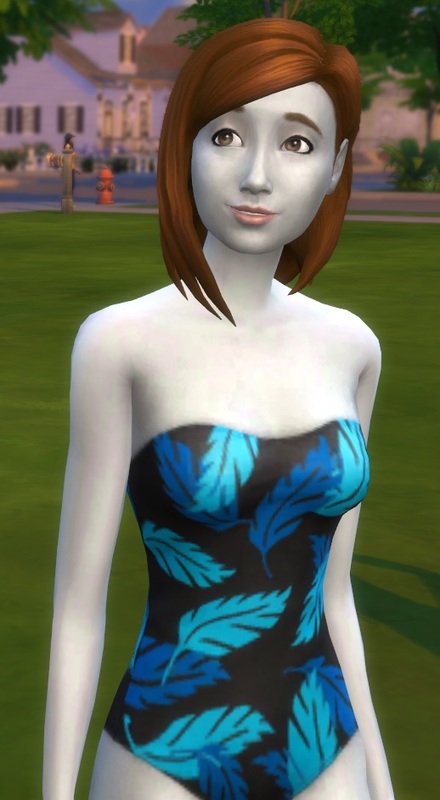 Example: skins with 'Human' tuning are randomized for human sims, with 'Vampire' tuning are randomized for vampire sims, etc. Skins with 'Fantasy' tuning don't seem to get randomized at all. The 'Occult' flag(s) determines if a skin shows up for humans, aliens, vampires, etc. Future occult types will probably have their own skins too. A skin must have an Occult / Human tag to show up for humans, an Occult / Alien tag to show up for aliens, etc. I've also attached a set of templates showing how the body is mapped to the textures. Face textures: There are about a billion of them and I haven't even tried to identify them and include them in the tool. I've uploaded two packages with all the face textures I could find, so anyone wanting to work with them can use that as a starting point. Extract the attached zip, open the folder, and run TS4Skininator.exe. Please report any problems/suggestions/comments about the tool here. Please post problems and questions about creating specific content in the TS4 / Create / CAS Parts forum. With thanks to Peter and Inge Jones, Kuree, and everyone else who's contributed to s4pi and s4pe, and to Snaitf for figuring out how to make non-default skintones. Fixed overlay manager to update the overlay list when changes are committed. Added selection of ages teen to elder to previewer. Fixed bug causing new content clones to replace game skin textures. Moved property tags to external files which can be easily updated without making a new version of the program. -- The male and female adult instance IDs have changed and are updated in the program. -- The new female breast overlay images are now included. -- Note that the adult females do NOT have breast overlays. Teen, YA, and Elders do. -- Note that the old male adult textures for the muscle/bony/fat/thin morphs are being overlaid by the new textures. They show through faintly but I dropped them from the program since there's already a million billion textures to deal with and I don't think they're visible enough to matter. Updated for compatibility with male chest overlays, which seem to have been implemented in a patch sometime in July or August. Bugfix: The program will now export textures with mipmaps intact. New feature: In the "Create/Edit Default Replacement Skin Details" tab there's now an added "Convert Outdated Package to New Instance IDs" tab. This will convert a pre-June patch default replacement skin to work with the current game. New feature: A new "Manage Flags for All" tab has been added to the Clone Package Editor in the "Create/Edit Custom Skin Colors" tab. This new function allows you to add or remove property flags/tags from all the skintones in a package. Sorry this took so long - RL travel, family commitments, and illness. Added full support for toddlers. Will now recognize the Occult / Vampire tag so skins can be enabled for vampires. Updated for new version of TONE file. I'm not sure when the new version happened, but I probably didn't test adequately after the February patch, so apologies. Bugfix for errors when editing old format skintones. Again I didn't test adequately, sigh. Added proper scaling for different screen resolutions, so hopefully this will help with appearance and resizing issues. Bugfix for program exit when unable to find game package files. Some fiddling with preview skin color which probably won't make any visible difference. Updated the body UV templates to include toddlers. Added ability to import/export PNG image files. 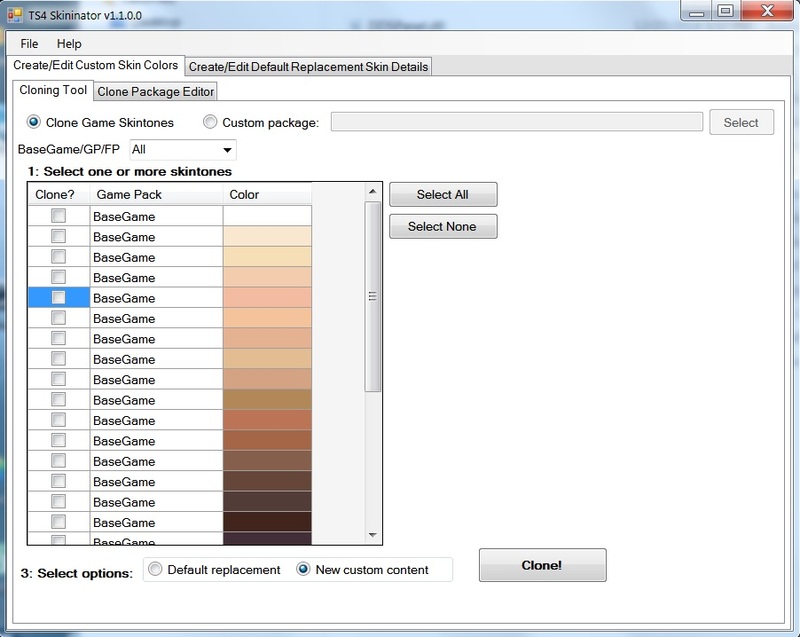 -- All skintones in the package can be updated to the latest version, enabling the Randomization Tuning. The conversion code will make an educated guess of which tuning to select based on property tags.